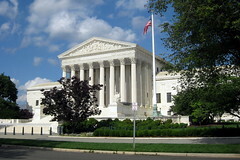 I was thinking about the US Supreme Court, one of our three co-equal branches of government. With the retirement of John Paul Stevens in 2010, the Court no longer has any outstanding members. I do not know the complete history of the Court; however, the two members of the Court I hold in highest esteem are John Marshall and Louis Brandeis. John Marshall was Chief Justice from 1801 to 1835. His decisions and policies set the precedents that still guide the Supreme Court. During the Revolutionary war, Marshall served with Washington and later wrote a multi-volume biography of his friend. He served as Secretary of State under John Adams and functioned as president when Adams was out of the capital. That was the custom then before the vice-president took over that responsibility. Louis Brandeis served as an Associate Justice from 1916 to 1939. After he resigned from the Court, he devoted his full-time energies to the cause of establishing Israel. Before Brandeis joined the Court, he was America’s highest paid lawyer. However, he devoted only 50% of his time to earning money. The other 50% was devoted to social causes where he did significant good for no charge. He was a pioneer in using economic data to promote his legal cases before the courts. He changed how cases were argued before the Supreme Court, and after joining the Court, he helped change how the Supreme Court decided cases. In my estimation, two admirable Justices.